The scent from the steaming of diakon cake, the oil sizzling sound of deep fried snacks, the preparation of the togetherness tray (a box of candies and snacks for greeting of guests), on the night of Chinese New Year eve, to prepare for the visiting of friends and relatives in the next few days, all works were done in the kitchen. Those were the time I loved to spend with my mom, watching her using all of her strength to shred the diakons, maneuvering in the tiny little kitchen tending several dishes at the same time. My mom does not like cooking that much, she treats it as a chore most of the time, but in time of needs, she can perform magic. I miss all the hussel and bussel of Chinese New Year. In fact, this year, I almost forgot about what date Chinese New Year was on until I watched the evening news. Being away from my hometown for too long and preoccupy with work make me stop caring about any festive days from far away. But on New Year Day, my parents called from my hometown. Loud noises of people filled up the other end of the line. My parents and all my uncles, anuts, cousins and their kids, were all together having a new year dinner banquet. I got a chance to talk to relatives that I had not seen for ages. At that moment, I truly felt that I was right there with them, celebrating the new year together. This is what Chinese New Year is about: family, friends and food. To celebrate Chinese New Year, I made the spicy wontons. 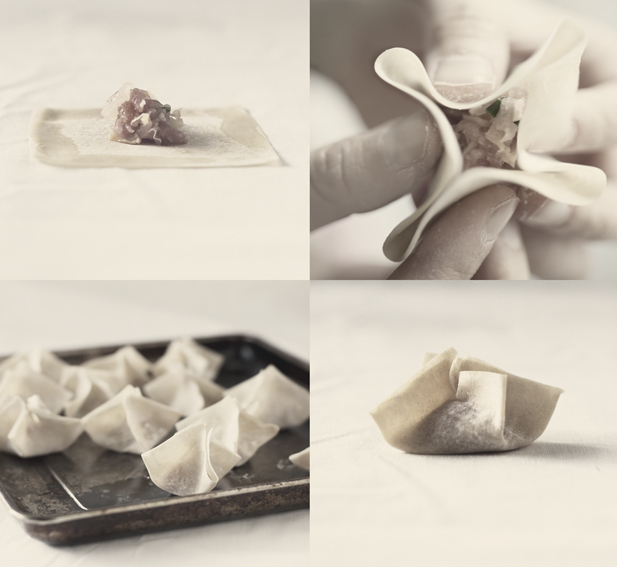 Wontons are easy to make and everyone has their own way, using different ingredients to make it. Here I used both ground pork and shrimps because I like the texture of the pork and the sweetness of the shrimp together. As for the aromatic ingredients, green onion is a must, sometimes I also use shitake mushroom and cilantro. This time, I added some dried scallops to increase the seafood flavor. 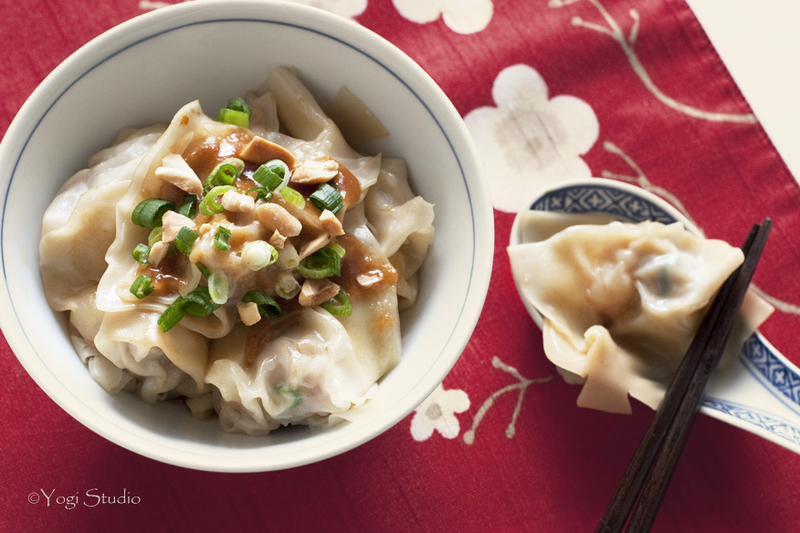 Peanut sauce is optional, but it does add another dimension to the wontons. N specially requested peanut sauce to come with his wontons. The recipe makes a lot of wontons. After I fold them into individual wontons, I put them on a tray and freeze them. Then I put them in the ziplog bag. So, I can have wontons to enjoy for a few weeks. 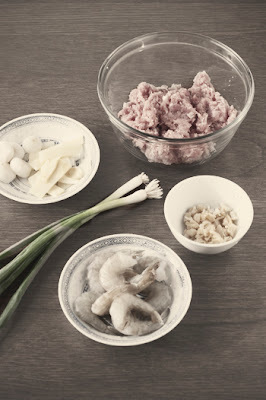 Mix ground pork, water chestnuts, bamboo shoots, green onion, ginger and dried scallop together. Add the seasoning. Set it asides. Mix shrimp and seasoning in another bowl. 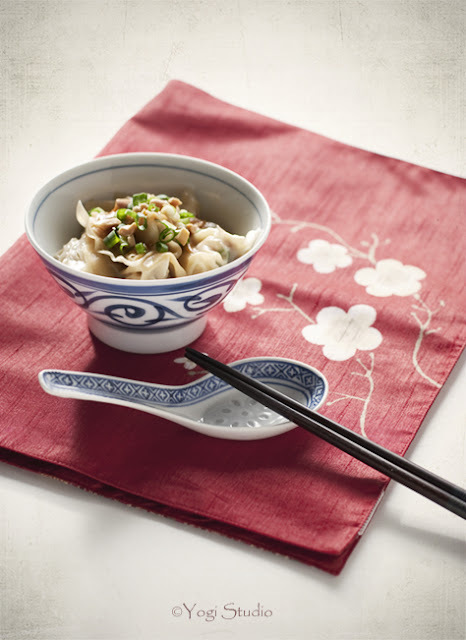 Folding the wontons: Take out a wonton wrapper, place a teaspoon of filling and a piece of chopped shrimp in the middle. Using your finger, put a thin film of water on the edge of the wrapper. Using your thumbs and index finger on both hands, bring the four corners of the wrapper together. Squeeze the wrapper to close the dumpling. Boil 2 cup of water and one cup of chicken broth in a saucepan. Add 1 tsp of salt to the boiling water. Add wontons to boiling water. Keep them boiling for 3 to 4 minutes until wontons rise up to the surface. Remove and drain the wonton with a slotted laddle. Put wontons into the bowl with spicy sauce. Mix well with sauce. Garnish with green onion and serve. If using peanut sauce, drizzle sauce and sprinkle peanuts on top and serve. Mix the all the ingredient together. Whisk until smooth. Add more water if you like a thinner consistency. Peanut sauce, though is not strange to me, sounds to be an interesting combo with wontons. Your wontons look very nice. I usually eat dumplings with black vinegar, peanut sauce sounds like a nice dip. Fantastic wontons! Delicious, one of my favorites. I haven't gotten up the courage to try to make wontons yet...but I love them so I may need to make an attempt them soon! @foodies at home - You definitely should give it a try! Wontons are so easy to make and you can make the fillings with all sorts of stuff...even with cream cheese!